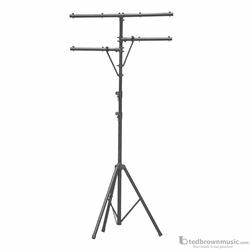 This classic stand allows for maximum height adjustments and will support up to 8 par cans. The stand telescpoes with friction adjustment knobs and locking pins provide added security. The top T-bar holds up to 4 par cans, while the side mount bars will hold an additional 4 par cans. 1 T-bar and 2 side bars, holds 8 par cans. 3 Shaft, 2 clutch system. 10 1/2' Max height. 110 lbs. weight capacity. Black finish.